In order to buy groceries, commute to work, go to school, visit the doctor’s office, or pick up any medication you or your family might need, you need a way to get there. But if you make $15,080 a year (the annual income of someone working for $7.25 an hour, the federal minimum wage), odds are you won’t be able to afford either a car or public transportation. It costs, on average, $8,698 per year to own a car in the U.S., once you pay for gas, insurance, tires, registration, and maintenance. If you make minimum wage, that’s more than half of your annual income. Public transportation isn’t cheap either: even if you live near a bus or light rail station, you can expect to pay a steep price for a monthly pass. In Charlotte, North Carolina, where the minimum wage is $7.25, a transit pass costs $88-$176 per month, or $1,056-$2,112 per year. Poor families spend 28% of their income on food, and 1 in 6 Americans say they didn’t have enough money to buy food that they or their families needed in 2014. In one of the world’s wealthiest countries, it’s a tragedy that so many struggle to feed their families. Nearly 9.6 million Americans don’t have a bank account. And almost 25 million people that have bank accounts, have trouble getting a credit card or loan. These people still have to pay bills and provide for their families, which means they rely on payday loans and other high-cost alternatives to fill in the gaps. On average, these families spend more than $3,000 a year on the exorbitant fees and sky high interest rates that accompany these services , just so they can make ends meet. Everyone knows childcare costs a lot, but do you know how much? If you have a baby, you can expect to pay as much as $17,062 per year for childcare. The price drops once your kid is older, but at almost $13,000 per year, a full-time minimum wage worker would still have to spend almost their entire paycheck just for daycare. Many see a college degree as a ticket out of poverty. But the high costs of going to college saddle many college graduates with tens of thousands of dollars of debt (the average student debt for 2015 graduates was $35,051). Also, consider the barriers to getting a college degree as a non-traditional student: you might need expensive, out-of-reach childcare. You might have a job (or two or three) with irregular hours. You might not have a car. You might not live near public transportation. Even if someone with a low income figures out a way to fund their education, they still face a lot of obstacles that get in the way of them furthering their education and improving their economic situation. 1 in 4 renters pays more than half of his or her income on housing, far above the 30 percent of income that is widely considered as affordable. Homeownership is at historic lows, and millions of renters have joined the market, pushing up rents and in no state can someone working full-time at making minimum wage afford a one-bedroom apartment at Fair Market Rent. 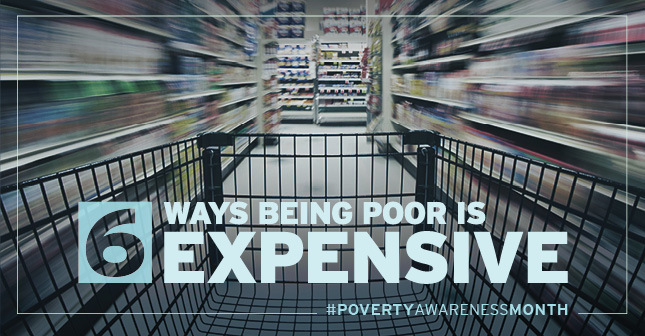 If you add up how much it costs to be poor, with half of your income going to transportation, half going to housing, a quarter going to food… it doesn’t take a math whiz to see how incredibly expensive it is to be poor in this country, and how hard it is to break out of the cycle of poverty.